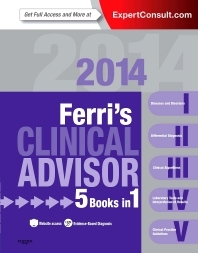 Ferri's Clinical Advisor is the fastest, most effective way to access current diagnostic and therapeutic information on more than 700 common medical conditions. Dr. Fred Ferri’s popular "5 books in 1" format provides quick guidance on menorrhagia, Failure to Thrive (FTT), Cogan’s syndrome, and much more. Now featuring expanded online components, it makes the answers you need for your family practice even easier to find - anytime, anywhere. Rapidly find the answers you need with separate sections on diseases and disorders, differential diagnosis, clinical algorithms, laboratory results, and clinical preventive services, plus an at-a-glance format that uses cross-references, outlines, bullets, tables, boxes, and algorithms to expedite reference. Get the insurance billing codes you require, including ICD-9-CM codes, to expedite insurance reimbursements.